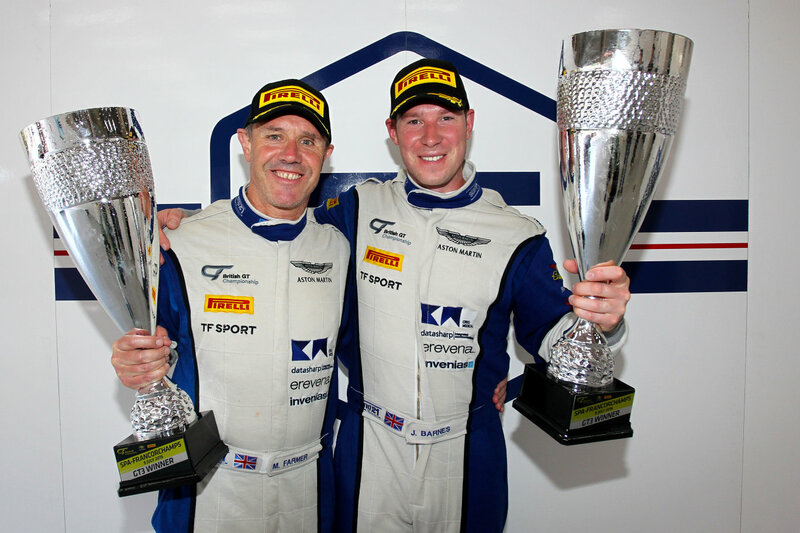 TF Sport won Round Six of the 2016 British GT Champion at Circuit de Spa-Francorchamps with its #11 Aston Martin Vantage GT3 driven by Mark Farmer and Jon Barnes. 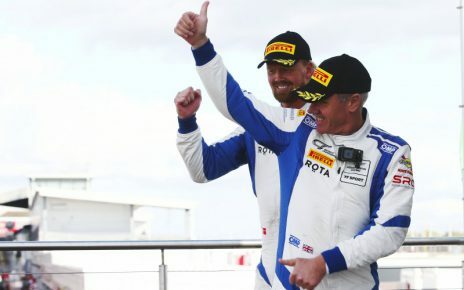 The victory was Mark Farmer’s first in British GT and the second for Jon Barnes in the championship in eight years. Second across the line was the #31 Team Parker Racing Bentley Continental GT3 driven by Rick Parfitt Jnr and Seb Morris. Completing the podium positions at the finish was the #57 Black Falcon Mercedes-AMG GT3 driven by Oliver Morley and Dani Juncadella. However a post-race penalty saw the #57 car handed a thirty-second penalty which elevated their Black Falcon team-mates of Miguel Toril and Abdulaziz Al Faisal in the #58 Mercedes-AMG GT3 to third. The opening lap saw a collision between the #6 Barwell Motorsport Lamborghini Huracán GT3 driven by Liam Griffin and the pole-sitting #31 Bentley Continental GT3 with Rick Parfitt Jnr at the wheel. Parfitt then collided with the ##79 Black Bull Ecurie Ecosse McLaren 650S GT3 driven by Alasdair McCaig which resulted in suspension damage to the #79 car. The #1 Aston Martin Vantage GT3 with Andrew Howard at the wheel also suffered in the opening lap confusion when it lost a wheel rejoining the track. Farmer in the #11 TF Sport Aston Martin Vantage GT3 took advantage and drove to the front but was subsequently passed by the ##63 GRT Grasser Racing Team Lamborghini Huracán GT3 driven by Hunter Abbott. The #11 TF Sport Aston Martin Vantage GT3 with Jon Barnes at the wheel regained the lead, however, after the pit-stops and driver changes. Meanwhile the #31 Team Parker Racing Bentley Continental GT3 which had proved so competitive in qualifying was pushing the #63 GRT Grasser Racing Team Lamborghini, now with Rolf Ineichen at the wheel, hard. Seb Morris passed the #63 car for second place with 39 minutes remaining. Jon Barnes, however, in the #11 TF Sport car, was now over five seconds in the lead and would prove a tougher challenge. Morris pushed Barnes all the way to the line but did not find the opportunity to close the gap to less than .6 of a second which left Barnes to take his first British GT victory since 2008. TF Sport’s victory means that it has the lead in the Team Championship with 185.5 points, 6.5 points ahead of Barwell Motorsport on 179. Team Parker Racing lie third with 95.5 points. In the Drivers Championship, Derek Johnston and Jonny Adam retain the lead on 106 points after a seventh place finish. Second is the Barwell Motorsports driver pairing of Jon Minshaw and Phil Keen on 97.5 points. The Team Parker Racing pairing of Seb Morris and Rick Parfitt Jnr lie just two points behind Minshaw and Keen on 95.5 points. 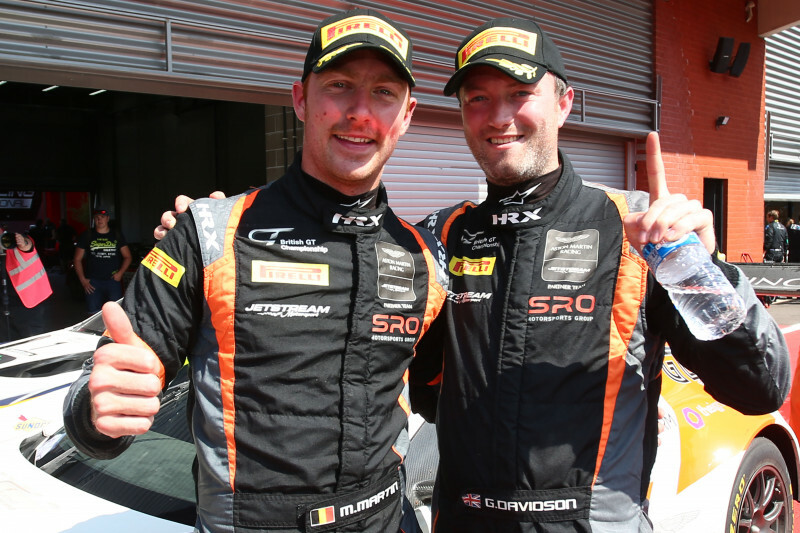 In GT4 Alex Reed and Joey Foster driving the #51 Lanan Racing Ginetta G55 GT4 took their maiden GT4 victory ahead of the #50 PMW World Expo Racing / Optimum Motorsport Ginetta G55 GT4 driven by Mike Robinson and Graham Johnson. Taking the final step on the podium was #42 Generation AMR Macmillan Racing Aston Martin Vantage GT4 driven by Jack Mitchell and Matthew Graham. The #59 Black Bull Ecurie Ecosse McLaren 570S GT4 driven by Ciaran Haggerty and Sandy Mitchell looked very strong going into the race, as pole sitters in GT4. However the car ran into problems ahead of the pit-stop window after which the #51 car led to the flag. 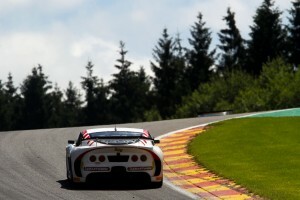 In the GT4 Teams Championship RCIB Insurance Racing lead with 143 points, followed by Century Motorsport on 120. PMW World Expo Racing / Optimum Motorsport are third on 114.5. In the GT4 Drivers Championship the PMW World Expo Racing / Optimum Motorsport pairing of Graham Johnson and Mike Robinson lead on 114.5 points. In second is the #407 Beechdean AMR pairing of Jack Bartholomew and Jordan Albert. 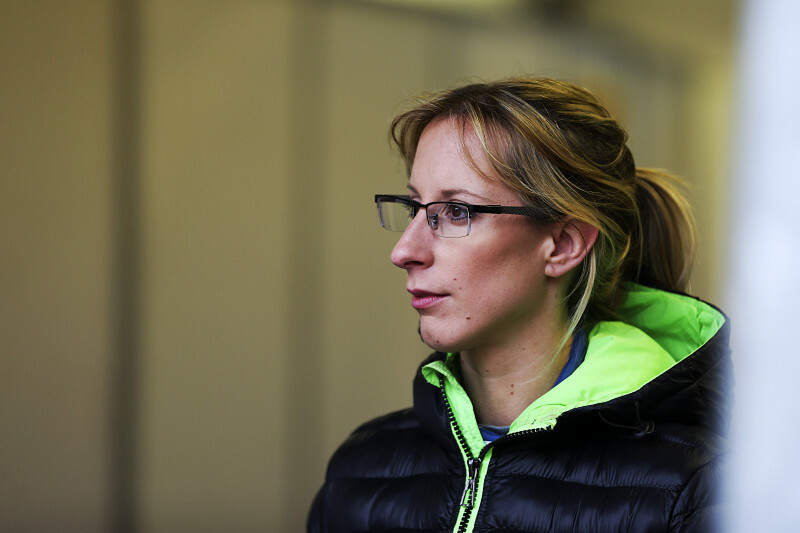 Third is the #73 Century Motorsport paring of Anna Walewska and Nathan Freke. The seventh round of the 2016 British GT Championship will be held at Snetterton on August 7.